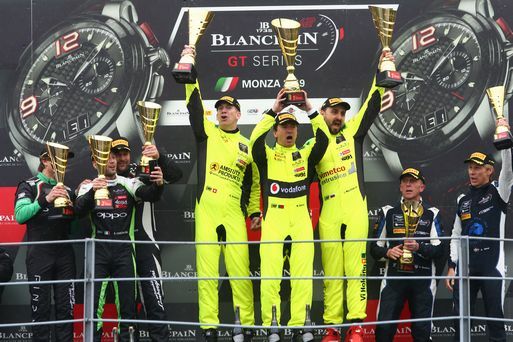 Barwell Motorsport kicked off the 2019 Blancpain race season in fine style at Monza last weekend, scoring a dominant Am Cup victory for the Adrian Amstutz/Leo Machitski/Miguel Ramos Lamborghini Huracan GT3 Evo. 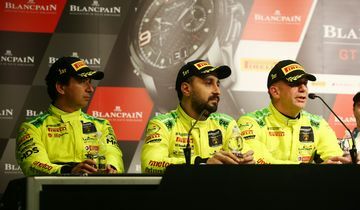 For reigning Blancpain Am champions, Adrian and Leo, this made it a hat-trick of wins after their triumphs in the last two rounds of 2018 at Spa and Barcelona. 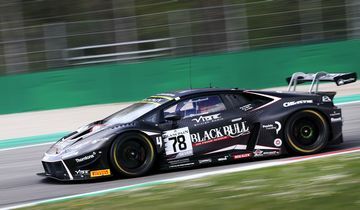 The Amstutz Produkte/Vimetco Extrusions/Vodafone backed Lamborghini finished an impressive 16th overall out of the 49-car field, also coming home ahead of all the Pro-am Class entries. Our Silver Cup Huracan GT3 Evo of James Pull, Jordan Witt and Sandy Mitchell was looking good to make it two podiums out of two for the team, after a stunning qualifying performance put them fifth overall on the grid. 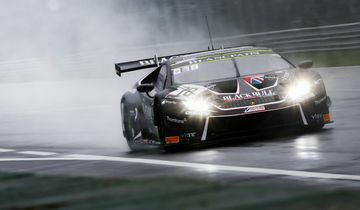 The BlackBull Lambo ran strongly in the top 10 and second in class during the first hour, but damage sustained early in the race took its toll on the car’s performance and it slipped down to 9th in Silver Cup at the end of the 3-hour encounter. For the Am Cup crew the race proved to be a relatively straightforward and undramatic affair. 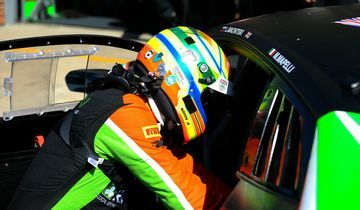 The stand out performances were Miguel’s in qualifying and then extremely rapid stints from both Adrian and Leo in the race, which meant Miguel just had to stroke the car home during the final hour. From class pole position Adrian stretched out a lead of over 20 seconds during the first half of the opening stint, before a Safety Car period effectively cut that down to just a few seconds advantage over the Raton and Boutsen Ginion Lamborghinis behind him. With these cars being piloted by their fastest drivers, Amstutz soon found himself in a battle and took the wise decision to stay out of trouble and bring the car into the pits in a solid third place. Leo then moved the car back into the lead during his stint, which became a comfortable advantage when the second placed Raton machine got separated from us by a lap by another Safety Car intervention. The sister Barwell Huracan unfortunately had a much more eventful race, and didn’t get the result that the team or drivers truly deserved. All of them performed superbly in qualifying, with Jordan going fastest overall in session 2, and their combined efforts put the car second in class and fifth overall, taking the scalps of many a factory Pro car along the way. 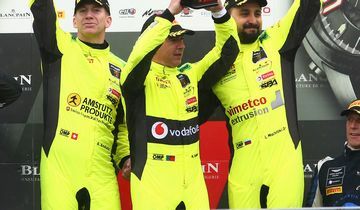 James made a good start and became immediately embroiled in a three-way tussle for fourth position with the Pro class AKKA Mercedes and FFF Lamborghini, driven by Dennis Lind. The Merc was clearly holding the two Huracans up during the early laps, which caught Lind out as he got too close and had to anchor up unexpectedly to avoid hitting the back of the AKKA car. James then was suddenly faced with having very little room to play with and inadvertently hit the back of the FFF Lambo, sending it off the track and unfortunately causing some extensive front end damage to the Barwell Huracan. Whilst he was able to continue, the resulting extra drag caused by the damaged front bodywork and aero was significantly hurting the pace that he was able to lap in. With the rain easing off and the track gradually drying during the first hour, the circuit and weather conditions were starting to suggest that a move from wet tyres to slicks would be the order of the day for the second stint. The race leading and Silver Cup leading AKKA Mercedes, along with many other front-running Pro cars, confirmed this when they took on slick tyres at their scheduled stops. We followed suit when James came in to hand over to Jordan, but then unfortunately the car picked up a drive through penalty for pit lane speeding during this changeover, which cost us a chunk of time and dropped the car down the order as it followed shortly after a Safety Car had bunched up the pack. The loss of front-end grip was also hurting Jordan’s efforts to build up tyre temperature in the slicks, and this meant the loss of pace was compounded further. However we were still in the thick of the fight for a potential top six Silver Cup class result going into the second half of the race when we were dealt a final piece of misfortune, as the overall race leader had just overtaken us immediately before a Safety Car period which put us a lap down on the Silver Cup pack in front and left us powerless to improve on ninth place. Not the reward that everybody had deserved, but the BlackBull Silver Cup crew had certainly showed huge potential for what they are able to achieve going forward.